39 entries categorized "Microsoft Office"
Office 2007 in "Classic Mode"
Over a year ago, at the very first presentation to customers of Office 2007, at "Sneak Peek" events we put together, the very first question I fielded from a customer after demonstrating the new user interface was: "Is there a 'Classic View?'" I can recall being taken aback: "Why would anyone want to go backwards?" "Can't these people see how much better the new interface is?" "Was this a bad demo?" "Am I in the wrong career?" And so on. As it turns out, the cost of learning the new user interface has been a common theme in the succeeding months, especially for power users of Office. They know where everything is (even if it's not intuitive or even rational) in their existing version, they are highly efficient in using Office 2003, and they don't want to change. Now that a new calendar year is bringing with it a new budget cycle and a new Service Pack, Office 2007 migration looks to be a more immediate promise/threat than ever for many people who let others be in the "first wave" of Office migration. 1. Mapping workbooks. Have you ever wanted to know what the equivalent ribbon function is in Office 2007 to something buried in Tools --> Options in your favorite Office 2003 application? 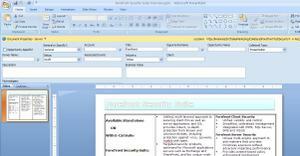 These workbooks exist for Word, Excel, PowerPoint, Access, and Outlook. 2. Interactive guides. Similar to the mapping workbooks, but even richer, these interactive guides literally show you, via split screen, how Office 2003 functions are performed in Office 2007. So, clearly, the "classic mode" question has been asked more than once. Fortunately, it's been answered more than once as well. Office Live Workspace, Google Apps, IBM Symphony, Zimbra: Buckle Up! If I didn't have a day job, I would love to write 1,000 words on all of this. Just within the Microsoft world alone, I can't wait to see how Office Live Workspace, Groove, SharePoint, FolderShare, and Microsoft SharedView all are sorted out and positioned going forward. Microsoft has delivered the public beta of OCS 2007 (including Speech Server 2007) and Office Communicator 2007 in the form of a 180-day trial edition. You can check out: http://www.microsoft.com/uc for more information about these products. These products will be interesting to me because of their integration with SharePoint technologies, for example: I can look up a document stored in a SharePoint document library, then interact with the author via e-mail, instant messaging, phone, LiveMeeting, right from within the portal. The example below shows the rudimentary capability around this right within Microsoft Office SharePoint Server 2007 (without OCS installed). This combination of traditional document-based collaboration with integrated communications will be very exciting for some people seeking richer collaboration. I received 20 copies of the media (one DVD and one CD-ROM per kit) today, and encourage you to contact me if you're trying to get your hands on it – I will send you a copy (with priority to existing KMA customers, of course). At long last! A much-awaited whitepaper has been released by Microsoft detailing how different versions of Office work with current (Windows SharePoint Services 3.0 and Microsoft Office SharePoint Server 2007) SharePoint technologies. and detailing features in each. In a decidedly unscientific poll, most SharePoint customers to whom we've spoken envision migrating to SharePoint on the server first, then upgrading users' Office versions, then upgrading users' desktop operating systems to Vista. They perceive this to be the least disruptive approach, and I would generally agree but would counsel IT leaders to also consider incremental benefits of new integration features. For example: Your organization has a problem organizing PowerPoint content that could be solved by implementing MOSS 2007 and using slide libraries to manage that content more effectively. I'd recommend upgrading key PowerPoint users' desktops to Office 2007 concurrently with upgrading to MOSS 2007 to take advantage of this. Too much SharePoint hype? Not enough! I found Mary Jo Foley's blog post today to underscore a point that Steve Ballmer brought up at last summer's Gold Partner luncheon at the Worldwide Partner Conference, and one that I've been relating to people at events ever since: Microsoft is as ambitious with SharePoint on the server today as they were with Office on the desktop ten years ago. There's been an awful lot of hype about SharePoint in the Microsoft and Microsoft Partner communities, but from messages from Ballmer and others, SharePoint will be critically important to knowledge workers for some time to come. As someone on the front lines using, selling, and deploying these solutions every day, I don't see SharePoint as an operating system per se, as alluded to in the post, but as an important application layer between users, applications, and corporate data stores, a suite of server products that helps knowledge workers manage information via ubiquitous (web), rich and familiar (Office) tools. This also reflects Microsoft's "Software + Services" response to the broader "Software as a Service" industry trend. select the slides you want to create a presentation "on the fly"
a presentation from a CXO to a Board, where a different executive might be responsible for a slide or set of slides (e.g., finance slide(s) with earnings information, HR slides with headcount/attrition information, operations slides with backlog or quality metrics, etc.). An "Executive" slide library would allow for a secure place where these slides could be maintained, and the person responsible for pulling them into a presentation, such as a CXO (or more likely, an executive assistant), can be apprised of any changes to the source slides. 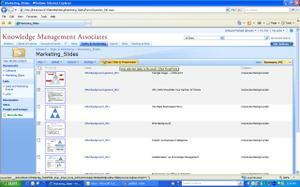 A web part for a slide library is a standard component of Microsoft Office SharePoint 2007. I've stored some standard KMA messaging/positioning slides in here as an example. I could store all my slides in this one library then use views to show the relevant ones (using filters on the slide metadata), or can create separate slide libraries for different sites. Note the default thumbnail views of each slide, with the columns I've added for tailored metadata. I can then go into the slide library and select the slides I want to include in a new presentation using the "Copy Slide to Presentation" button in the toolbar. When I've selected the slides that I want, I click this button, and am prompted for a few options, including the option to be notified whenever component slides in the library are updated. 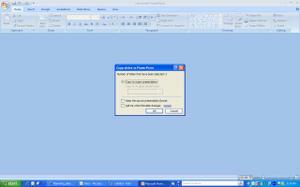 Once I complete these options, when I click "OK," the slides are copied into a new presentation. Voila! A new presentation created on the fly from a controlled, secure library of slides and that notifies the creator when component slides are updated! Neat, simple, and a feature that has already saved me hours of finding and assembling presentations. As I near the end of two weeks of using Microsoft Office SharePoint Server 2007 in a production environment with Office 2007 on my desktop, I have begun to notice some very useful things under "real-world" scenarios. 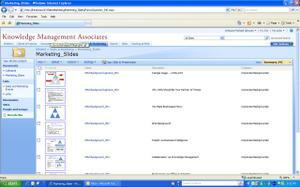 When I create, for example, a slide deck in PowerPoint 2007, I store it in a "collateral" library on KMA's Sales & Marketing portal. By selecting [Office Button] --> Prepare -->Properties, I now can see all the metadata I've created for this document library (i.e., the document properties) on the screen, right from within PowerPoint. The *really* cool thing is that we've installed and configured the business data catalog, so that I can have metadata fields validate against my CRM system (note the fields with the little page-check icon next to them). So, when I publish a proposal or a presentation, I can tie them to a particular account or opportunity in CRM, without double-entry of account/opportunity info. Our next step will be to get SharePoint's search configured with the business data catalog so that it searches not only on the portal, but also in this line of business system (CRM). My personal favorite, from a user seeing the ribbon for the first time: "Is there a 'Classic View'?" 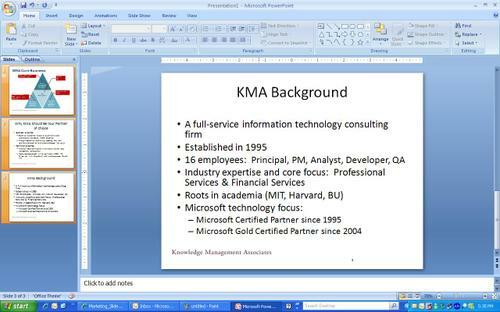 KMA will be actively engaged with additional launch events, including the official Vista/Office launch in Boston on January 24, Office 2007 Tips and Tricks seminars (timing/locations TBD), and Lessons Learned seminars featuring workflow, a common theme among participants in our Sneak Peek events. OK, I've been a little Microsoft and product-heavy in the posts lately. However, I firmly believe that the launches of Vista, Office 2007, and Exchange 2007 represent an inflection point with respect to corporate technology investment, and perhaps more broadly with respect to information worker productivity. 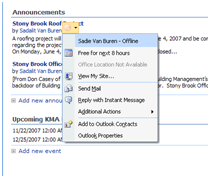 I've run Office 2007 since Beta 2 became available in June of 2006, and presented Office 2007 in several "Sneak Peek" events around the metro Boston area over the past several months. Today, I finally installed the first production release to my main computer, along with IE7 (finally!) and a new Outlook client for MSCRM. Given other trials and tribulations I've had with Vista and Office 2007, I was pleasantly surprised at how smoothly it went. The biggest gating factor for me was that I needed the new Outlook client for Microsoft CRM in order to be productive. Since implementing MSCRM about 6 months ago, I've gotten very used to using CRM from within Outlook (after some challenges with the web client), and I've felt the pain of not having a smoothly-working, well-integrated CRM-to-Outlook integration, so I definitely had to wait until after the late December release of this new CRM integration. I just recently got time to do my testing, and found it to work as expected, so I'm off and running with the new apps! Now I can use Groove!